Never let it be said that group therapy isn't effective. Prior to hosting a new Top-Level Domain (TLD) workshop for a group of Australian applicants last week, the only therapy I would have advised for new TLD applicants was electroshock therapy — given the confidence-sapping delays and the catastrophic impact of constant changes to the program such as Digital Archery, Name Collisions and GAC Advice. Fortunately, most applicants have been able to prevail in spite of the issues — to their immense credit — and that's probably why I'm a new TLD strategy consultant and not a psychiatrist! Last Wednesday, approximately 25 attendees came to Melbourne for a community-building session to give them the opportunity to share success stories, challenges, discuss launch strategies and learn about the latest developments within the new TLD program. While the content of the various presentations was helpful, the key take away for many applicants was one simple fact; you're not alone! There is no comparison to hearing a fellow applicant discuss their challenges and what worked for them. All attendees left with the feeling that it's not all doom and gloom, and it was also flattering to hear the generous feedback our clients provided about relying on a trusted partner like ARI Registry Services for both their technology and advisory needs. 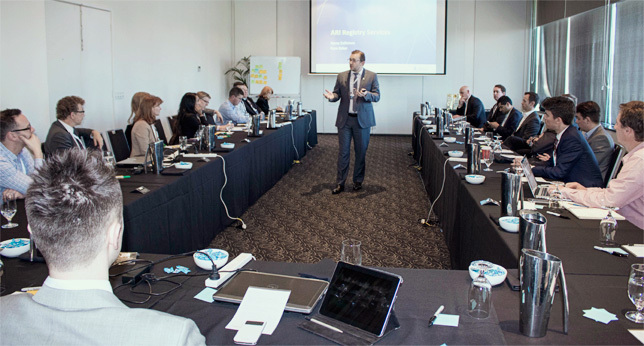 ARI’s new TLD workshop – Approximately 25 attendees came to Melbourne for a community-building session to give them the opportunity to share success stories, challenges, discuss launch strategies and learn about the latest developments within the new TLD program. We were treated to thought-provoking presentations from applicants who generously offered a rare glimpse into the strategies they employed (or will employ) to launch their TLDs. For instance, Glenn Ruscoe, the applicant for .physio, spoke of his passion for the profession and how through the use of a robust TLD strategy and focused efforts for his target audiences he hopes to create a digital asset that will underpin the entire physiotherapy community around the world. We also heard from Monash University's Andrew Norman about the marketing and PR success they received around the launch of the world's first .brand — .monash — and their new www.destination.monash promotional website. Finally, Bob Turner from the Australian Cancer Research Foundation spoke with passion as he described their innovative approach to positioning .cancerresearch as a global education tool capable of raising research funds for the fight against cancer. Personally, it's an absolute privilege for me to contribute to the development of these TLDs via our strategic consulting program and I feel honoured every day to work with these inspirational digital thought-leaders. Also on the day, ARI Registry Services' subject matter experts provided helpful advice to attendees on the topics of ICANN compliance, TLD strategy, the contracting process and navigating the ICANN ecosystem. Interestingly, the topic applicants seemed most interested in was when they heard ARI Registry Services' compliance expert Yasmin Omer speak about ICANN compliance and the audit process. Yasmin went into detail about how dotShabaka Registry recently responded to the audit regime and what applicants needed to do to prepare for this. The event was an unquestionable success, driven by a willingness of all attendees to share their thoughts and experiences to generate insightful discussions. We will certainly be doing more of these events, both domestically and internationally via webinars and online forums in the coming months. The key message, in the words of Michael Jackson — you are not alone. Local Time: Tuesday, April 23, 2019 09:02 PM PDT – Page Load: 0.3235 Sec.